WHAT IS THE “TRUTH” WHEN THE NUMBERS GET BIGGER? When Joe Hawkins left the US State Department, he left international intrigue behind and took a prestigious position as a professor at Oxford University. His younger brother’s disappearance upends his tranquil academic life and plunges him into a world where covert government intelligence meets international high finance. His search for Sam will uncover his brother’s ties to a shadowy London investment firm and an insidious network of international corruption. CAN YOU TRUST YOUR MEMORY AND SENSES? MI6 psychiatrist Kate Farrow has cracked some tough cases, but when faced with a suspected terrorist suffering from torture-induced amnesia, she knows she’s in over her head. The clock is ticking, and Kate must unlock the secrets in his battered psyche to prevent the loss of innocent life. Only by discovering what lies at the core of her own identity will Kate find a way to separate the truth from a shell game of greed and exploitation. 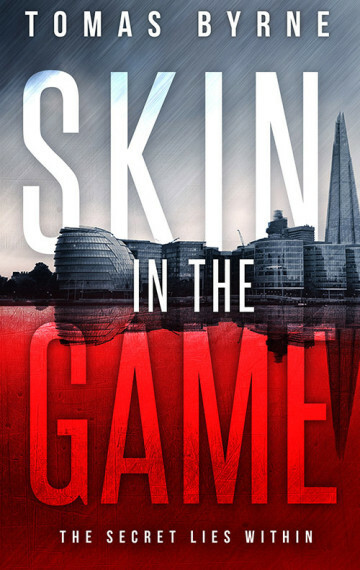 Skin in the Game is an intricately woven story of international political and corporate wrangling that takes readers on a fast-paced journey across Europe and the Middle East. With a backdrop that includes the globalization of capital, the geopolitics of scarce resources, the proliferation of international arms sales and the prospect of a perpetual war on terrorism, Skin in the Game brings in to focus how government and business interact behind the closed doors of international finance, and highlights the ongoing debate concerning information imbalances in our society. CAN SENSORY DEPRIVATION AND FORCED MEMORY LOSS DESTROY A NATIONAL IDENTITY? When our governments take morally dubious actions in the name of national security, whose interests do they have in mind, what ends are sought? To what extent are we willing to compromise our own principles in order to defend them, and is the greater good ever served?